Growing from strength to strength, Invenio starts 2018 with the addition of a new feather to its cap with a Gold Partner Status from Dassault Systèmes. The Gold Partner Status was awarded to Invenio at the Asia Pacific Dassault Systèmes sales convention held recently in Da Nang, Vietnam. 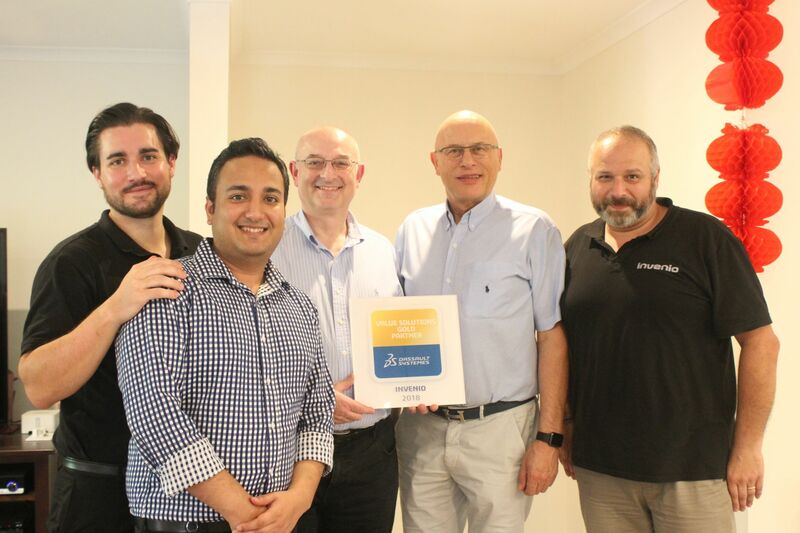 The award recognises Invenio as the only Dassault Gold Partner in Australia and New Zealand selling the Catia, Enovia, and 3DExperience software. Dassault Systèmes’ partner rewards program is done in recognition of partners who successfully market, sell, deploy, and support Dassault Systèmes solutions to customers all over the world. The award is based on objective merits of sales efficiency and performance, capacity to develop and certify customer skills, and the partner’s strategic alignment with Dassault Systèmes. “The Gold Partner Status is a validation of Invenio’s commitment to not only providing B2B engineering solutions to customers, but also providing support and comprehensive training for customers to get the most out of Dassault software and bring value to their clients,” said Ivan Meisel, Managing Director and CEO of Invenio. Catia is the world’s leading solution for product design and experience software, giving system architects, engineers, and designers the power to model any product in the context of its real-life behaviour. To further streamline the management of a product lifecycle, Dassault Systèmes also provides Enovia, a product lifecycle management software that enables creators, collaborators, and consumers to collaborate in the product lifecycle. Founded in 1990, Invenio is one of Australia’s leading providers of end-to-end human resource solutions with a network of highly qualified associates with working experience ranging from start-ups to blue-chip companies and government agencies. Today, Invenio is key in providing the ideal talent for a whole host of industries including, Aerospace & Defence, Engineering & Construction, Energy & Utilities, Industrial Equipment, Transportation, High Tech, IT, Life Sciences, Marine & Offshore, and Natural Resources. In today’s fast-changing engineering landscape, Invenio is a comprehensive solutions provider, which includes providing engineering solutions and conducting software training on the latest industry-standard engineering software.